Shawnee State senior and NAIA first team all-American Ashton Lovely attacks the basket in the Bears exhbition with Morehead State in late October. 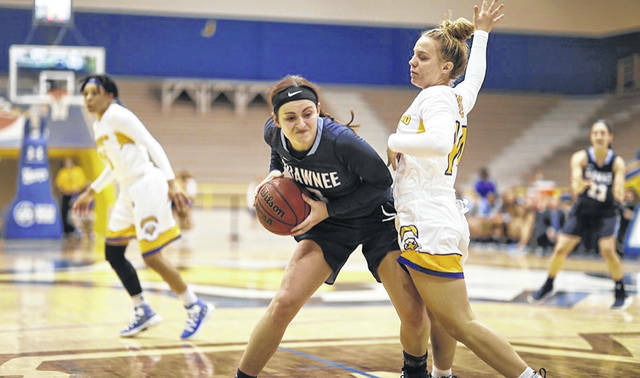 In what should be no surprise to anyone who lives in Southern Ohio, the Shawnee State women’s basketball team is off to yet another great start to their season. The second overall team in the NAIA Division II preseason poll Bears are firing on all cylinders, winning each of their first five games by an average of 36.4 points per game which includes wins over Kentucky Christian University, University of Northwestern Ohio, Bluefield College, Point Park University, and West Virginia Institute of Technology. In the Bears most recent game, senior returning NAIA first team all-American Ashton Lovely had a season high in points with 33 as Shawnee shot 53.8% from the field as a team and 40% from behind the arc in their contest with WVU Tech. The Bears starting off the season 5-0 is a great accomplishment, but the road to improving on that undefeated start begins to be a bit challenging as the month of December approaches. As Nickel mentioned, the Bears will travel to Asbury University in Wilmore, Kentucky this weekend to take on the Asbury Eagles Friday night at 6:00 p.m., as well as Oakland City University Saturday morning with a noon start. And if the road forward didn’t get hard enough there, Shawnee will go up against 12th ranked MidAmerica Nazarene University and 5th ranked Freed-Hardeman University next weekend in Jackson, Tennesee at the NAIA Invitational Classic. If the name Freed-Hardman doesn’t ring any bells, the Lions of FHU are the current defending national champions at the NAIA Division II level, meaning that Shawnee will get a good test early in the season that should very well prepare them if they hope to make a run in this season’s NAIA tournament. Tipoff between the Bears and the Asbury Eagles is set for Friday at 6:00 p.m. on the campus of Asbury University.